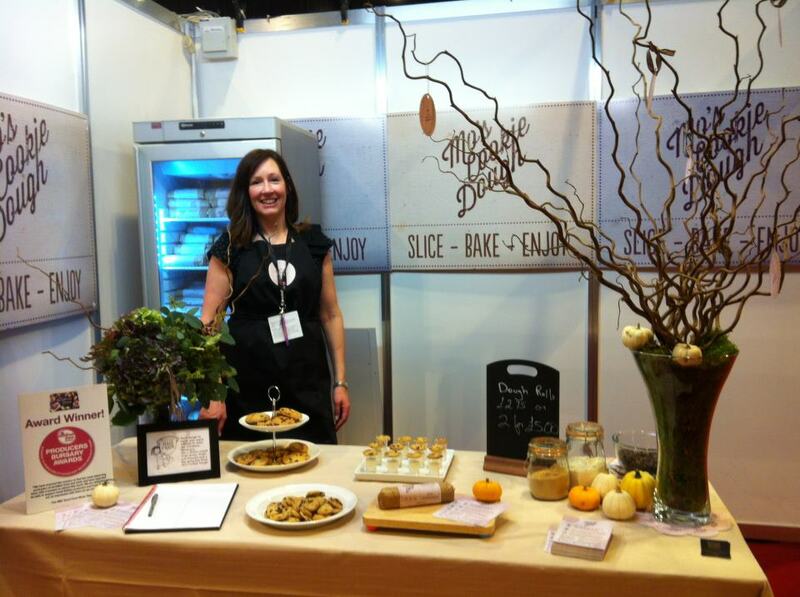 As you may remember, recently I visited the BBC Good Food Show at the SECC in Glasgow. There were dozens upon dozens of stalls selling and promoting their products. One that certainly caught my eye, was Mo’s Cookie Dough – a compny selling freshly prepared cookie dough, ready to slice and pop into the oven.. I ventured over and helped myself to a sample of the freshly baked, warm chocolate chip cookies. They were delicious and I cheekily took another sample (or two!). I discovered that the concept of Mo’s, is ‘Slice-Bake-Enjoy!’. The brain’s behind the operation is a woman called Morag Pavich, who was raised in the US of A and was apparently weaned on cookie dough (sounds like my idea of heaven). She wanted anyone to be able to bake great tasting cookies in no time at all, with the aid of American style pre-made cookie dough – but using high quality Scottish ingredients. Well, although I am not averse to making my own cookies, I certainly thought that having a couple of rolls of dough in the freezer was a great idea and bought some of the Chocolate Chip. Oatmeal Raisin was also available and I wished I had bought some of that now! Anyway, I got home, I sliced up the cookies and placed them on a cookie sheet, lined with greaseproof paper. I popped them in the oven for a little under the suggested time ( as I like my cookies a little on the underdone side of things). I removed from the oven, waited as long as I could and devoured half the batch. I finished the rest the following night, they were that good. Tender vanilla cookie jam packed full of choccy chips! I would definitely recommend Mo’s Cookie Dough to anyone who is short of time, or just not very confident at baking – as Mo says – Slice-Bake-Enjoy. And to make things even sweeter a percentage of the profits from each roll sold goes to local projects supporting vulnerable children. I've been in touch with Morag who asks for anyone wishing to purchase or find out more to contact her by e-mail or like her page on Facebook. Disclosure Statement: I purchased the ingredients myself and was not required to write a positive review. The opinions expressed are my own. Great cookie dough. Thanks for sharing.